Imago ex Roseto Piorum (1553), quae imago poesin Persicum et miniaturam Persicam miscet, ut in multis litterarum Persicarum operibus. "Iuvenis consilium patris de amore petit." Scaena ex Haft Awrang Jami, in fabula "Pater Amorem Filio Suadet." (Vide Nazar ila'l-murd, Institutum Smithsonianum, Vasingtoniae D.C.). Nur ad-Dīn Abd ar-Rahmān Jāmī (Persice نورالدین عبدالرحمن جامی), breviter Jami et Diāmī et in Turcia Molla Cami (natus Jam in Khorasan die 7 Novembris 1414; mortuus Herat in Khorasan die 9 Novembris 1492), fuit poeta Persicus qui philologus, peripatetici, philosophiae Islamica peritus et scriptor litterarum mysticarum eruditione innotuit. Praesertim fuit egregius scholae Ibn Arabi et sufi Khwājagānī poeta et theologus, eloquentia et metaphysica misericordiae explicatione praeclarus. Eius opera populo gratissima sunt Haft Awrang, Tuhfat al-Ahrar, Layla wal Majnun, Fatihat al-Shabab, Lawa'ih, Al-Durrah al-Fakhirah. Jami octoginta septem libros multasque epistulas scripsit. ↑ Etiam Mawlanā Nūr al-Dīn 'Abd al-Rahmān et Abd-Al-Rahmān Nur-Al-Din Muhammad Dashti appellatus. ↑ Hodierna provincia Ghor Afganiae. ↑ Hodierna provincia Heratensi Afganiae. ↑ Culture and Circulation: Literature in Motion in Early Modern India. BRILL. 2014. ISBN 9789004264489 . Browne, E. G. 1998. Literary History of Persia. ISBN 978-0-7007-0406-4. Chopra, R. M. 2014. Great Poets of Classical Persian. Colcatae: Sparrow Publications. ISBN 978-81-89140-75-5. Erkinov Aftandi. 1999. La querelle sur l`ancien et le nouveau dans les formes litteraires traditionnelles: Remarques sur les positions de Jâmi et de Navâ`i. Annali del`Istituto Universitario Orientale 59: 18–37. Erkinov, Aftandil. 2002. Manuscripts of the works by classical Persian authors (Hāfiz, Jāmī, Bīdil): Quantitative Analysis of 17th–19th c. Central Asian Copies. In Iran: Questions et connaissances. Actes du IVe Congrès Européen des études iraniennes organisé par la Societas Iranologica Europaea, Lutetiae, 6–10 Septembre 1999, vol. II: Périodes médiévale et moderne. Cahiers de Studia Iranica, 26, ed. M. Szuppe, 213–228. Lutetiae et Lugduni: Association pour l`avancement des études iraniennes-Peeters Press. Jami. 2010. Flashesof Light: A Treatise on Sufism. Golden Elixir Press. ISBN 978-0-9843082-2-4. Ebook. Rizvi, Sajjad. The Existential Breath of al-rahman and the Munificent Grace of al-rahim: The Tafsir Surat al-Fatiha of Jami and the School of Ibn Arabi. Journal of Qur'anic Studies. Rypka, Jan. 1968. History of Iranian Literature. Reidel Publishing Company. OCLC 460598. ISBN 978-90-277-0143-5. Shīrānī, Ḥāfiż Mahmūd. 1944. Dībācha-ye awwal [Praefatio prima]. In Ḥifż ul-Lisān, ed. Ḥāfiż Mahmūd Shīrānī. Delli: Anjumman-e Taraqqi-e Urdū. Williams, John. 1961. Islam. Novi Eboraci: George Braziller. De Jami. Iran Chamber Society. Jami's Yusuf and Zulaikha: A Study in the Method of Appropriation of Sacred Text. Salaman and Absal, in Anglicum conversus ab Edward Fitzgerald, 1904. 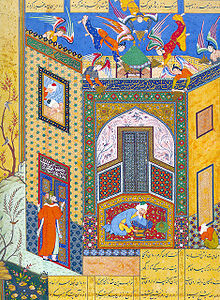 Persian deewan of Jami. Inoneratus ab Javed Hussen. Novissima mutatio die 27 Septembris 2018 hora 03:46 facta.